Here you will find all necessary information to install, configure and operate our product / service. How to use the product? 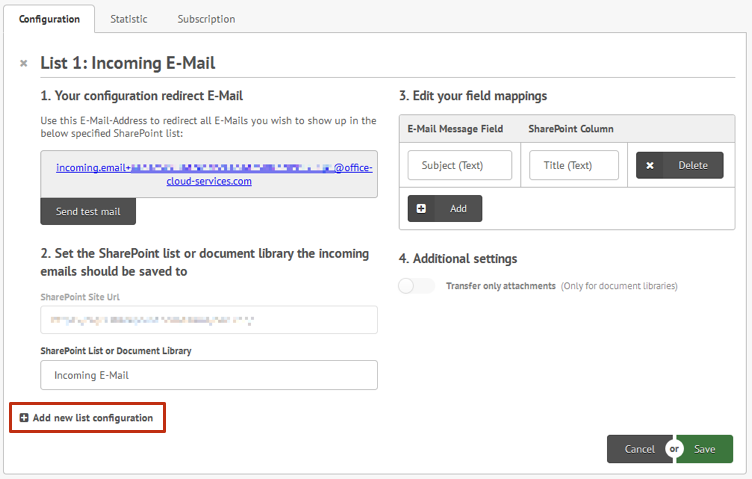 Subscribe for the product on the tab "INCOMING E-MAIL"
Under "Edit Field Mappings" you can specify which columns are to be filled in the SharePoint list. 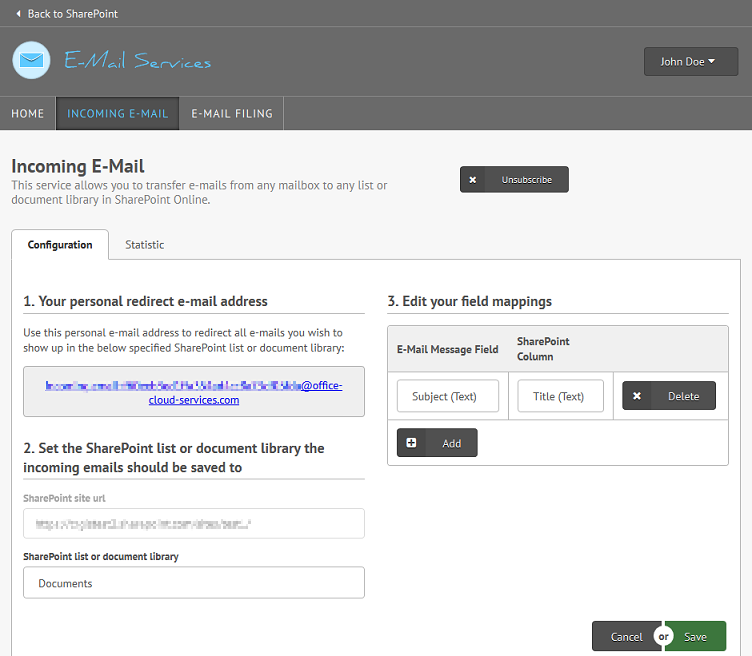 You can select an email message field and specify the corresponding SharePoint column. Please keep in mind that only certain assignments are meaningful, e.g. 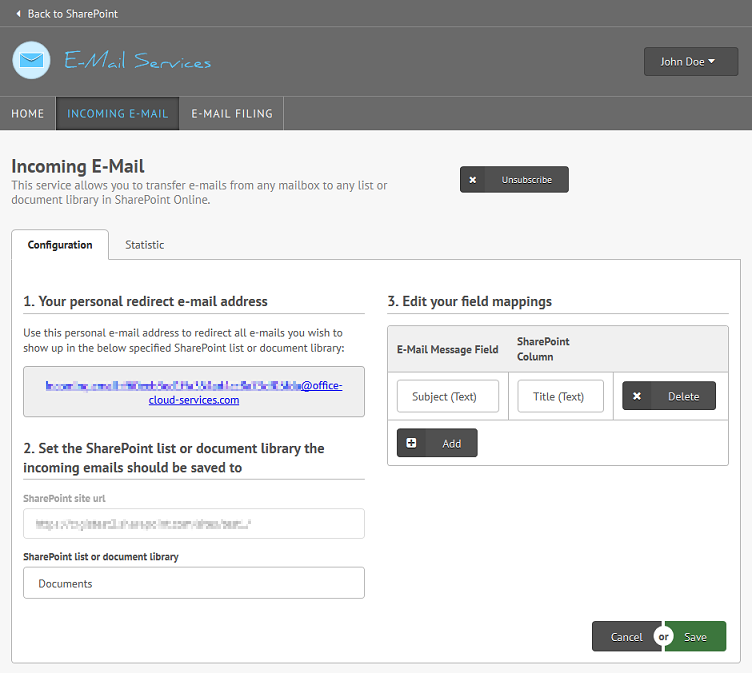 you can only assign email message fields, that contain a date, to SharePoint columns of type "Date/Time". If you change the column configuration of the SharePoint list, please remember to adjust the field mappings, since otherwise incoming emails can not be processed correctly. 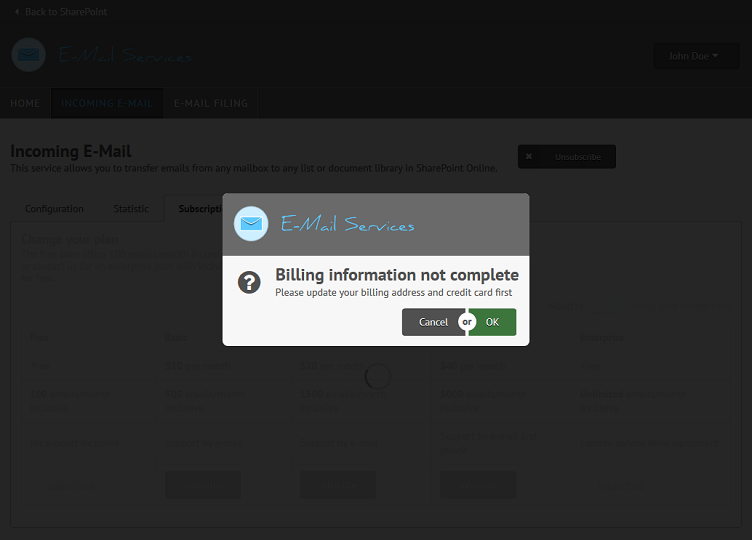 By activating the option "Transfer attachments only" you can configure our service to save only the attachment of the incoming email. 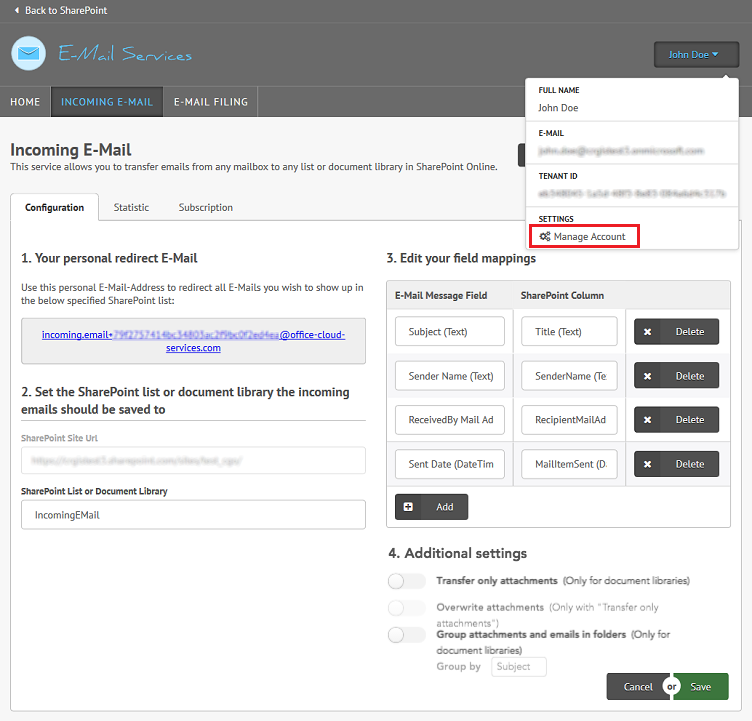 By activating the option "Overwrite attachments" you can configure our service to overwrite existing elements within the target document library. The service uses file name and file expression to check for duplicates. If this option is not active, files, which would have been overwritten, will be numbered with (n) at the end of the file name. 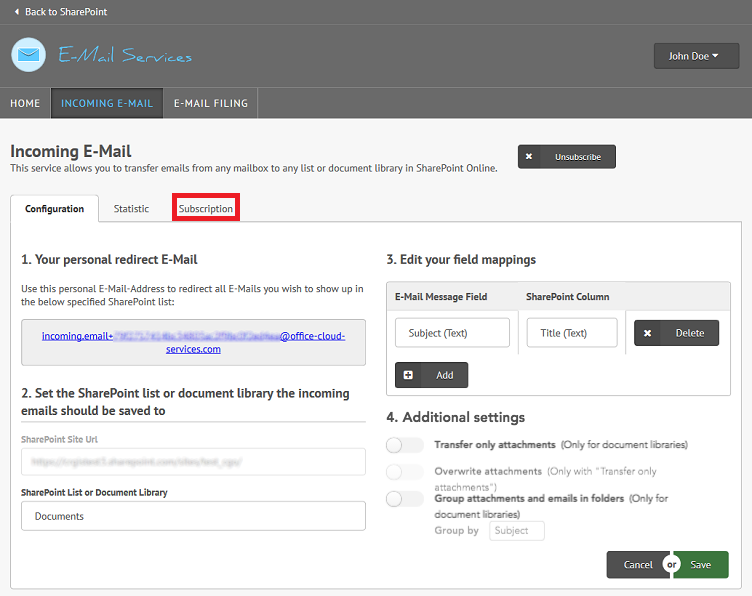 By activating the option "Group attachments and emails in folders" you can configure our service to group attachments within folders in the target document library. You will have to choose a second option to configure the specified folder names. You may choose between "Subject" and "Sender name". If the option "Transfer attachments only" is active supplementary, only attachments of the incoming email will be stored. Use the button "Save" to save your configuration, "Cancel" will discard your changes. 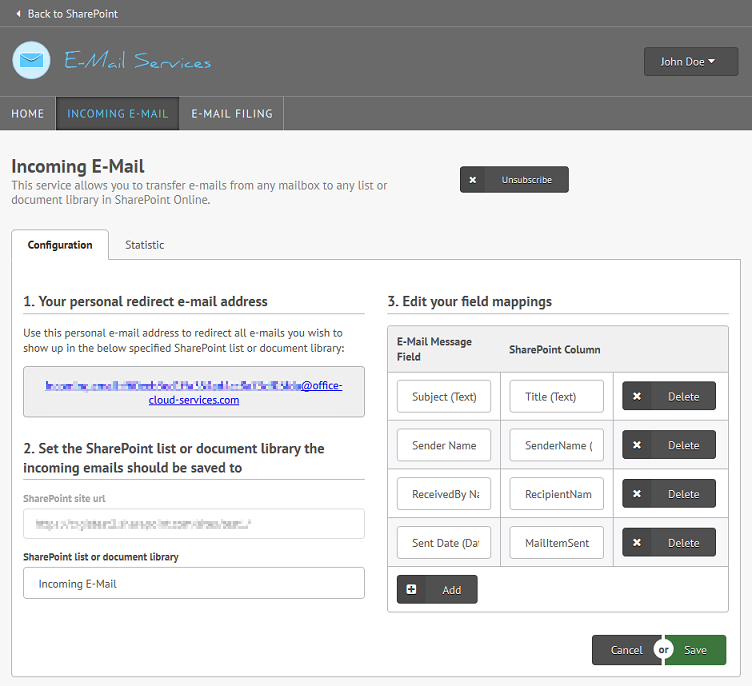 Have you subscribed to the Premium or Enterprise plan, you can configure several lists within a SharePoint Web. To add a configuration for another list, click "Add new list configuration". 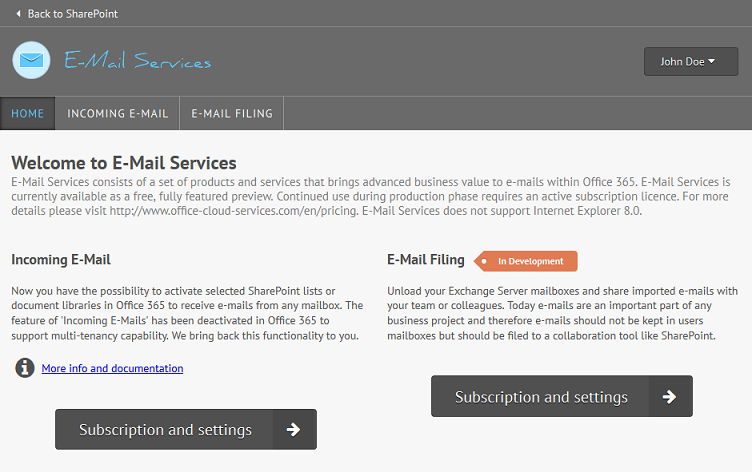 Each configured list has its own redirect mail address. Click on your username and select "Manage Account"
Under "General" you can adjust the settings of the primary account administrator. 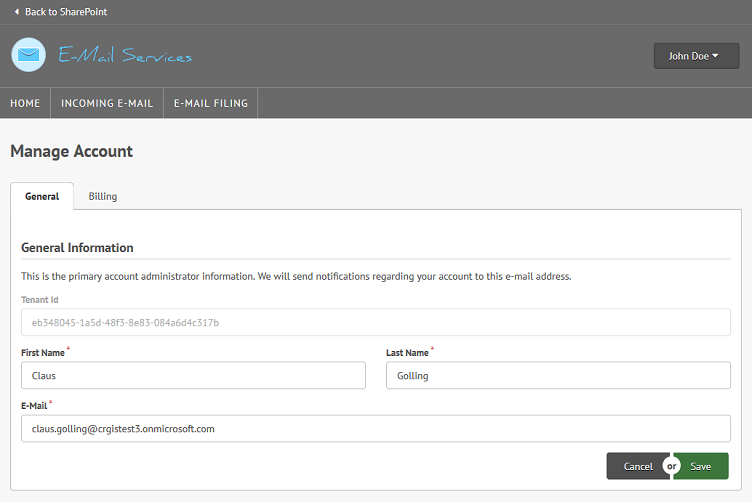 We will send notifications regarding your account to this email address. 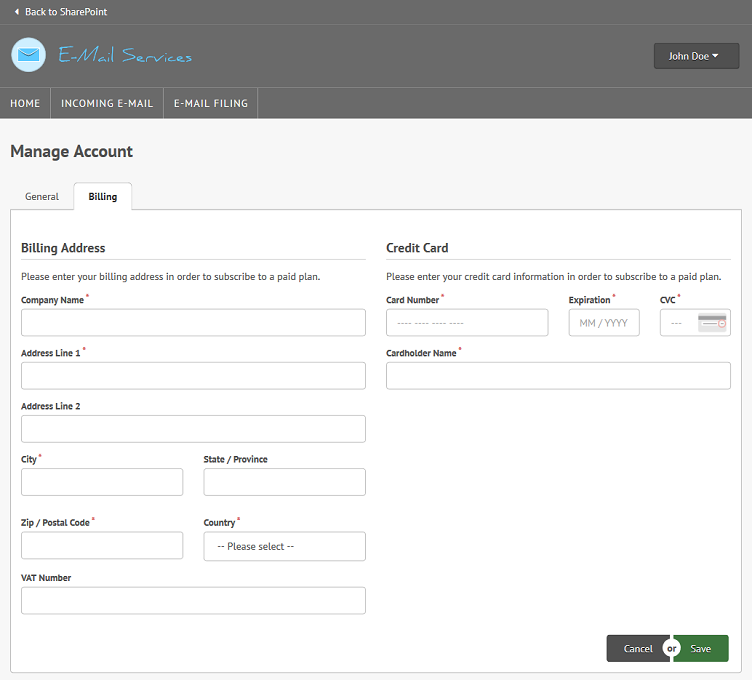 Under "Billing" you can provide your billing address and credit card information. Please notice that currently only credit card payment is possible. 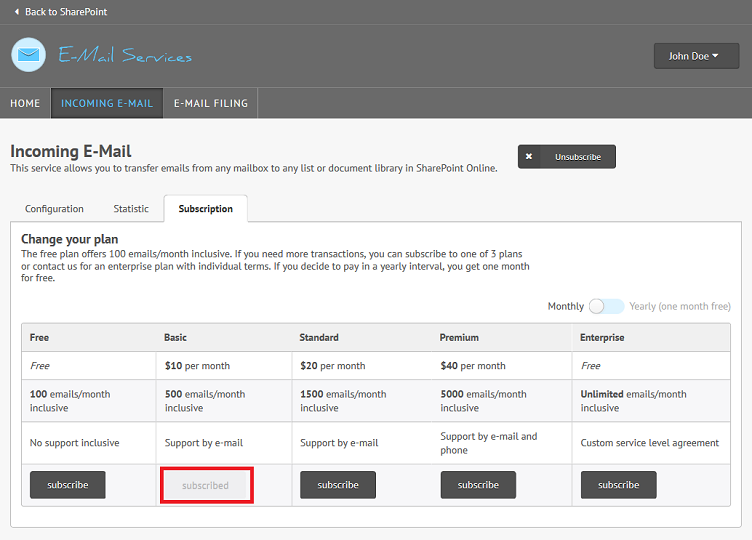 The payment information is a prerequisite to subscribe to a paid plan later. 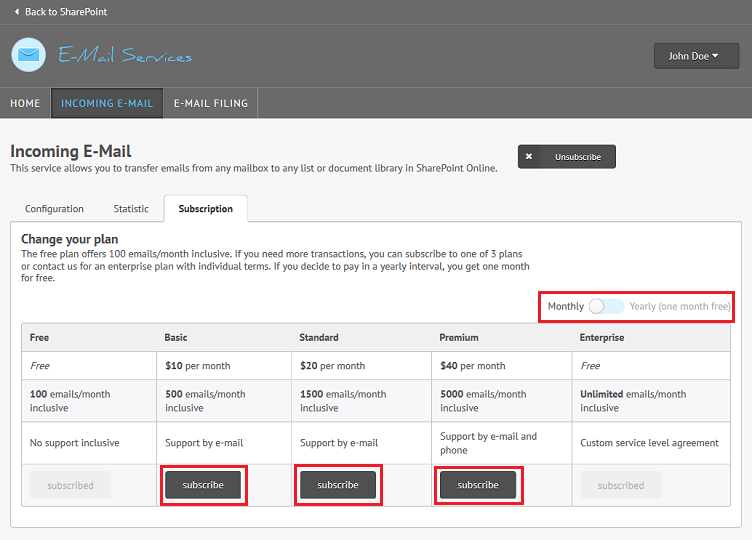 Select your desired plan by clicking "Subscribe". You can choose between monthly and yearly payment. With yearly payment you get one month free. If you have not provided your billing information under "Manage Account", you will be prompted to provide your billing address and credit card information. 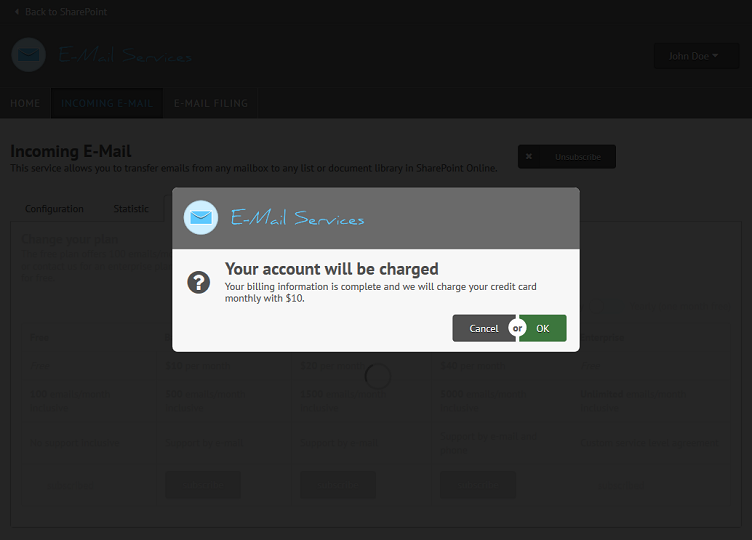 The following confirmation notification indicates that your credit card will be charged. Your selected plan will be shown as "Subscribed". You can revert to the "Free Plan" at any time. Following a final settlement no further costs will be charged on your credit card.